Have you ever been at a pregame, after party, office happy hour or brunch but been bored by the typical Vodka Cranberry? Well, now you can create the same amazing cocktails you’d expect from a top bartender, anywhere. The best part, YOU get to be that world-class bartender yourself. Now, you can make your party the destination of choice simply by ordering Pink Dot’s Craft Cocktails On Demand. 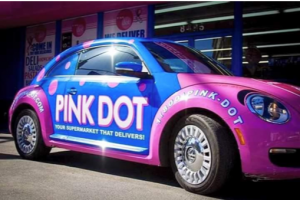 Pink Dot, LA’s Original Delivery Service, has launched the world’s first on-demand, create-your-own cocktail program. With this program, you receive everything you need to make fresh, craft cocktails at the comfort of your home or office. Each cocktail kit makes up to 16 drinks! 1. Select one of our seasonal cocktails from pinkdot.com/cocktails: We’re currently featuring the Pinkarita, our pink take on a spicy margarita. 2. Let us deliver: Feel free to add any snacks or small bites from our kitchen, including personal pizzas, sandwiches, and salads. One of our delivery drivers will be there in under an hour. 3. The bar is open for business: Quickly follow our step-by-step recipe card and start making craft cocktails that everyone will be talking about. We’re offering FREE Delivery on your first cocktail kit. Use code: WEHOVILLE at checkout.